Vacation time is precious and travel anxiety is the worst. No matter how much you rack your brain, there's always this voice in the back of your head that says "I feel like I'm forgetting something, but I don't know what it is." We stay as organized as possible leading up to the trip so that we can enjoy our time off from work 100% stress free. No one can remember everything in their heads, so we rely on our trusted "travel checklists" to keep us in check. Here's a great book we once read on the power of checklists. You don't want to forget the essentials lest you're forced to pay $15 for a small bottle of shampoo when you're desperate. You also don't want to binge pack, i.e. "I don't know what I will need so I'll just pack everything." This checklist is what we have been using for our own trips over the last 4 years. Each time we forget something, we remember to add it to the checklist. This is an essential step to ensuring the checklist stays current. This list is not meant as a comprehensive, one-size-fits-all list for everyone. Add new sections in the list for any additional items that apply to you. Did we miss something obvious? Tell us in the comments below! Subscribe with your email to get notified of future posts, frugal tips and free resources. 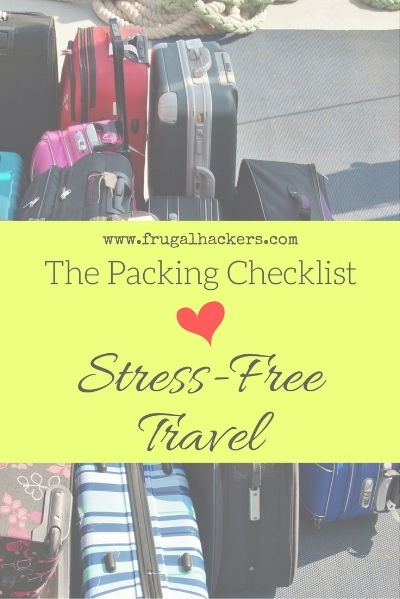 Click here to download the Frugal Hackers Travel Checklist. Priority Pass Travel Card. Helpful info guide here. Preparing for a vacation can be pretty stressful, but I hope that you find this checklist helpful! Want to save this list? Pin the photo below! What are your favorite planning and packing tips and tricks to help travelers enjoy their vacation days stress-free?